Canadian leaders are upset. Mexico is looking for alternatives. America is pushing deal breakers. That's how Round 5 of NAFTA, the three-nation trade pact being renegotiated at the demand of President Trump, sets up. Talks officially kickoff on Friday in Mexico City. The last round didn't end well. It concluded with an explosive press conference. Canadian Foreign Minister Chrystia Freeland and Mexican Economy Secretary Ildefonso Guajardo slammed the Trump administration's proposals in front of U.S. Trade Representative Robert Lighthizer. He in turn lobbed criticism back at them while they all stood together in front of cameras. That's not all. The U.S. recently won a longstanding trade battle with Mexico over tuna. Canada is pushing back against U.S. tariffs on Canadian lumber. Along with several other nations, Canada and Mexico are trying to revive TPP, the trade deal Trump left. Mexico is also pursuing talks with Brazil, Argentina and the European Union. Things could be easier this round, experts say. For one, the politics have changed. Republican senators support NAFTA and Trump needs them to pass tax reform so he's unlikely to threaten a NAFTA withdrawal like he did in October..
All sides agreed to take a different tack this time around. After the fireworks to end Round 4, Freeland, Guajardo and Lighthizer won't be attending this time, though they all recently convened at a summit in Vietnam. The three leaders are letting their negotiating teams take the reins and focus on areas where everyone agrees. The negotiators may also focus on items not currently covered by NAFTA, such as digital commerce. 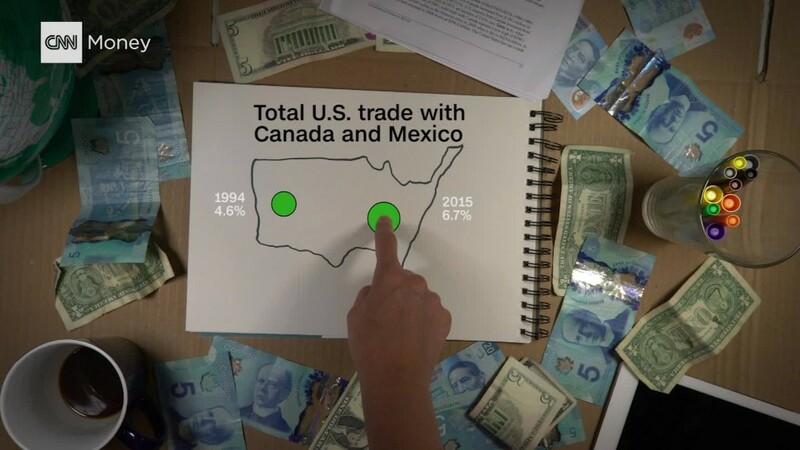 NAFTA became law in 1994 before the Amazon economy existed. "They could probably check some boxes off and make some progress," says Welles Orr, a lawyer at the firm Miller & Chevalier who served on the original U.S. staff that helped get NAFTA passed into law. But Orr adds:"They're going to give the negotiation time to revisit some of the more explosive, controversial, call it 'poison pill' proposals the administration has put out." Indeed, the thorny issues are unlikely to be discussed during this round, according to a Trump administration statement. The main disagreement revolves around how and where cars are manufactured across North America. NAFTA currently requires that 62% of parts used to make cars sold in North America must come from the region in order for the car not to be taxed at the border. The Trump administration wants to raise that threshold to 85% in an effort to create more manufacturing jobs in the United States. And there's another twist: Trump's team wants half of all car parts made in the region to be manufactured in the U.S., and the rest to come from Canada and Mexico. Canadian and Mexican officials made it clear that's a deal breaker. However, another proposal may be seeing the light of compromise. Trump's trade team is proposing a "sunset clause" which means NAFTA would terminate every five years unless all three countries agreed to keep it for another five. Initially, that was met with swift rebuke. But Guajardo, the Mexican trade official, is proposing an alternative. He said Wednesday that in the new agreement, all three countries could legally be forced to evaluate the benefits and costs of NAFTA every five years, though he wouldn't commit to terminating it. "We're making a compromise that every five years we will evaluate what's happening," Guajardo told Radio Formula in Mexico. But "we aren't putting in an automatic termination mechanism," because it would send a "bad message for investors."